The aim of this study was to determine the impact of on-site feeding practices on the reproductive indices of pigs reared under educated smallholder system in Imo State, southeastern Nigeria. The smallholder pig farms (S1, S2, M, L1, and L2) visited were divided into small-, medium-, and large-size farms, with small farms stocking 70–80, medium 120–130, and larger 230–270 pigs. In each farm, six weaner pigs comprising Large White, Landrace, and Duroc breeds were selected and their ages and initial body weights determined. The feeds offered to the weaner pigs were physically characterized for their ingredient components. Thereafter, representative samples of the feeds were subjected to proximate biochemical analysis on the 1st, 7th, and 13th weeks of the study using standard methods. Results showed that all the farms utilized palm kernel cake as their major energy feedstuffs, in addition to soybean, common salt, local fish meal, and vitamins premix. Data generated were analyzed using analysis of variance and descriptive statistics (mean and percentages). The mean crude protein values of the feed samples collected from these farms were of similar range (13.49–14.20%), while crude fiber and ether extract values were very high. Data on calculated metabolizable energy values were also relatively low for growing pigs. There was significant (p < 0.05) differences in the final body weights of the grower pigs after 14 weeks of feeding across the farms. There were significant (p > 0.05) changes in weight gain, with farms S1, S2, M, L1, and L2 returning 24.50, 10.00, 67.50, 11 00, and 7.50 kg mean weights, respectively. There is a slight increment in birth weight of piglets in farms S1, S2, M, and L2 when compared with those in farm L1. Direct observations revealed that farms S1, L1, and L2 practiced flushing techniques which invariably resulted in higher litter size recorded in these farms. The dams in farms S1, L1, and L2 were observed to gain more weight during gestation and shed little during lactation. Goodband, R.D., Tokach, M.D., Goncalves, M.A.D., Woodworth, J.C., S. S. Dritz, S.S. and DeRouchey, J.M. 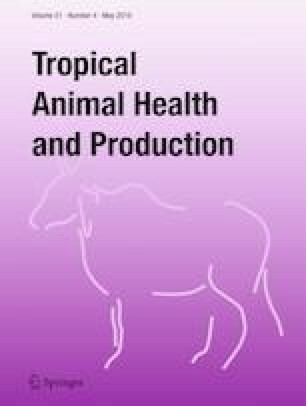 2013.Nutritional enhancement during pregnancy and its effects on reproduction in swine. Animal Frontiers. https://academic.oup.com/af/article-abstract/3/4/68/4638675. Accessed 17 Dec 2017. Okoli, I.C. 2005. Topical tip on pig production. www.tapasintitute.org/technicalnotes/htm.28:08:06. Accessed 12 Jan 2018.